Before looking at a property itself, it's all about choosing the right location. The Algarve has many unique areas to consider, specifically in the central part of the Algarve, such as the luxury resorts of Quinta do Lago, Vale do Lobo and Vilamoura. These areas of the Algarve are considered the prime real estate locations of Portugal. We may not be the biggest real estate agency in the Algarve... But, for you, we'll be the best one. Your Luxury Property is a specialist real estate company dealing exclusively with luxury properties in the Algarve; specifically in the areas of Quinta do Lago, Vale do Lobo and Vilamoura (the ‘Golden Triangle’). 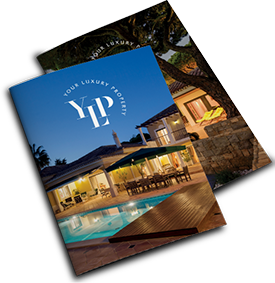 YLP offers an extensive portfolio of professional real estate services. Whether for buying a property, selling your house, refurbishing, construction and furnishing services, architecture or legal advice, you can count on our undivided attention, as well as credible and professional contacts to guide you through every step of the process. Our team speaks fluent Portuguese, English, French and Dutch. Your Luxury Property is dedicated to providing clients with expert support in all aspects of selling property. Registered with the authorities as a fully licensed real estate agency (AMI 10021), YLP promotes a discreet, ethical and proficient service. This issue we introduce you to some of the unique places in the Algarve, products and great restaurants, before revealing a selection of exclusive properties in central Algarve.